Mediteranean aesthetic, both architectural and otherwise, is not very often portrayed in LEGO, but when it is, builders tend to capture it very well. 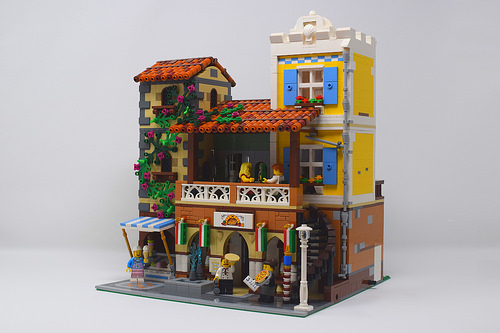 Mouseketeer111 has done one of these renditions as a modular-style building, and I can say from first-hand experience that this scene reproduces the spirit of an old Italian town perfectly. There are some simple elements that are important to conjure up the Mediterranean feeling, namely a barrel-tiled roof and Italian flags, but other details like bright colours, overgrown walls and the ice cream shop are what make this creation stand out. My favourite part, however, is the balcony. Not only is it well built, but it is photographed so that the shade looks even more inviting! Looking by the flag it’s rather Bulgarian restaurant.